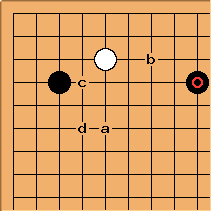 This is the lightest pincer available to Black, and is therefore suitable when White occupies the right corner and plans to play a counter-pincer. Joseki for it began to be developed when pros' obsession with the two-space high pincer started to decrease - which was around 1975, so that Ishida First Edition can't be relied upon. Jumping out at a is seen most often. White b, c and d are also common. For d, see 34PointLowApproachThreeSpaceHighPincerTaisha. White's tenuki here isn't so common, understandable if Black played this pincer to avoid the pincer stone coming under strong attack.